"Fly around a library on book vulture!" 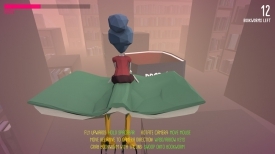 Silence in One Fell Swoop is a game where you play as some kind of magical librarian who rides on a…well how to describe it, it’s half a book and half a vulture, a flying bird book maybe the best way to describe it, and your objective is to make sure no one in the library makes too much noise by following the soundwaves and then swooping down and catching the “bookworms”. 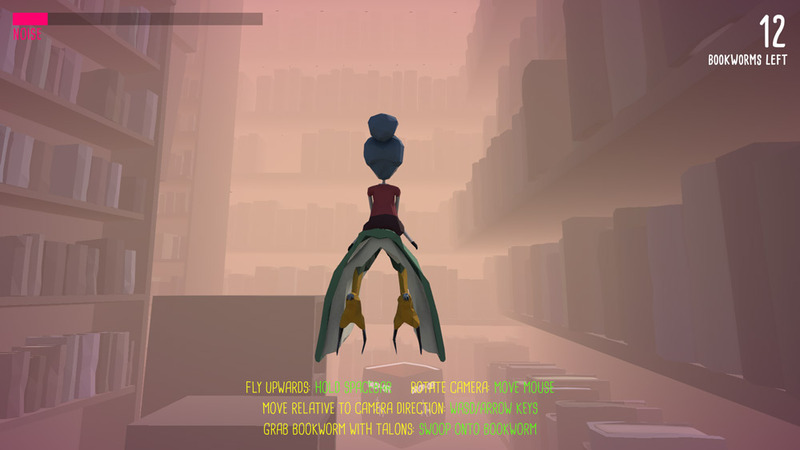 The game is actually really fun to just fly around on your weird flying book vulture thing once you get the hang of steering and swooping it can just be great to enjoy some time flying around the library even if finding the bookworms is a lot more difficult than expected. A cool idea for a game but sadly it feels like it lacks any real depth which is such a shame due to the look and mechanics of the flying feeling great if there was a bit more to it this could be an absolutely fantastic and unique game. You can download Silence in One Fell Swoop here for free.